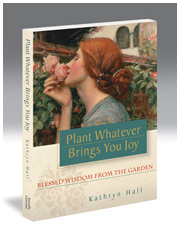 Readers of my book Plant Whatever Brings You Joy: Blessed Wisdom from the Garden will recognize that the title of this post is one of the 52 lessons upon which my book is built. And the Universe has kindly offered me a kick in the pants refresher course in that vital maxim. As many of you know northern California was hit recently with a major heatwave. Not much actual gardening got done, other than to make sure plants were watered and that roses were cut and brought inside in the early morning rather than to wither in the harsh sun. But finally the fog came in, the heat receded and early morning gardening was very happily resumed. 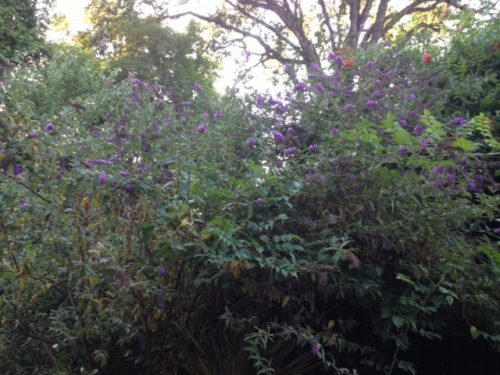 Let’s get out the clippers and do something about that rangy butterfly bush, shall we? So there I am, clippers in hand, tackling the cutting, cutting, cutting back of the largest of my three butterfly bushes. Butterflies tend to come in the warmth of afternoon sun, so morning is a time when they will remain undisturbed. And suddenly I encounter a branch with desiccated, curled up leaves, entombed in webbing. Ick. My mind flashed first to spiders and then immediately to tent caterpillars I’d seen in my two years in North Carolina. As I cut off the offending branch I noticed some movement inside the webbie mass, so I took the time to take a quick pic of what looked like maybe caterpillars. I knew that butterfly bush is notoriously held as strictly a nectar plant, never a host plant, so I did not consider for a moment I might be looking at butterfly larvae, so I blithely tossed them into the recycling bin. Done. Moments later I was unpleasantly surprised by two more such branches, though these had far less damage. And I continued my trimming of the buddleia without much more thought to the spidery branches. Until later, when I took the time to post the pic to FB asking if anyone might ID, and a bug expert in Davis posted a comment that “they look like mourning cloak larvae.” WHAT??? By now it was late afternoon, still hot from a burning sun, and, plagued with guilt I fretted until I went out into the garden, tipped the full recycling bin on its side and foraged through a mound of cuttings looking for the three webby ones I’d dumped that morning, acting against all hope. What could possibly survive? Amazingly I found the first and largest of the three upon which two or three tiny caterpillars appeared to still have life within them. And I placed the branch gently back into the safety of the butterfly bush where I’d found it. Eventually I found the other two branches, though there was no sign of life. I took small comfort that perhaps I’d saved one or two butterflies and went inside, still feeling bereft, as well as angry with myself that I was not following my own teachings! “Never pull up and discard what you cannot identify,” Kathryn! By now I was fully engaged and spent the next four hours going in and out of the house, checking for more babies. By the heat of the day I had watched and relocated fourteen of them, as one by one, over the hours, they found their way up to the top. Simply astounding. And so redeeming, as you might imagine. Whew! Not a total disaster then. By now I am questioning how it was that butterfly larvae were using my butterfly bush as a host plant, completely against everything I’d ever heard. How was this possible? I emailed Art Shapiro, a very well known butterfly expert and author, sending him a pic. 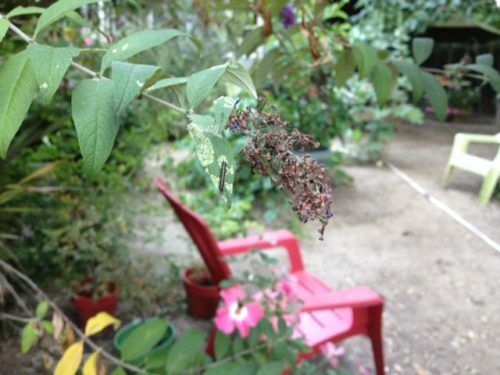 He wrote back to confirm they were butterfly larvae, but added, “These are not mourning cloak butterflies. They are checkerspots. And the only time I’m aware this has happened [like, ever, except one in a lab in 1940…] is in Mariposa County. The fad must be catching on.” Now my mind is completely blown. I have just rescued checkerspot larvae I’d tossed in a bin, and replaced them on a buddleia to continue on their path, and it’s an unknown phenomenon outside of one known such occurrence in Mariposa County, over 300 miles away?? Turns out that event was such a big deal Art and the woman who reported it, Katie, co-authored an article about the experience. I immediately wrote to her. 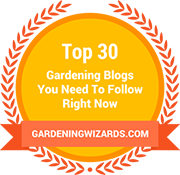 And learned she’s a gardening blogger! 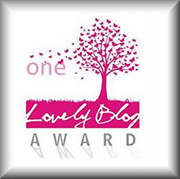 And she had written up the experience on her blog! As you can imagine this was getting more and more exciting and, frankly, amazing. So now I check on these babies every morning and a couple of times a day. They bunch up together at night. They are spreading out to new branches and munching down their small territory. They are getting bigger. And, yes, I’m posting to YouTube. Some of them are leaving the core group. 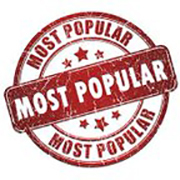 And some of them are encasing themselves inside little web tents. I just love it. Every minute of it. Art says they will eventually drop to the ground, where they will live amongst the ground litter, and then they will finally walk off way away from the butterfly bush, and encase themselves in their chrysalides. Apparently it’s unlikely I will ever see this part. (Boo hoo.) But I’m feeling profoundly blessed they chose my garden to live in one of my butterfly bushes (sorry for the rough welcome) demonstrating that buddleia does indeed, serve as a host plant, turning conventional scientific knowledge on its ear. Nature, ever adapting. How lovely and special and please help me spread the word that butterfly bushes can serve for some species as both a host and nectar plant, ensuring its place in butterfly history. Footnote, learned on Katie’s blog: Not all buddleia, apparently, are super fertile. If you are worried about their spreading, perhaps research ones that will not. I personally have never seen a buddleia moving about in my garden. 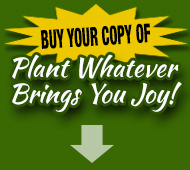 Book News: Recently I have uploaded the latest iteration of Plant Whatever Brings You Joy: Blessed Wisdom from the Garden to both Amazon Kindle and Barnes and Noble Nook. If you do read I would be incredibly happy if you were to rate the book in either of these venues. Thank you so much in advance. Very kind. It makes such a difference to author sales–also to our hearts. more interesting adventures from you. I approve your rule. I really enjoyed your thoughtful post. I imagine your 15 or 20 survivors will disappear in a month or so and show up again late next winter. Look for the slightly bigger caterpillars around February when they will wake up and begin feeding again. They will diappear again in April and reappear as butterflies in May. (The whole cycle may happen earlier for you because of the warmer temperatures where you are.) Now that you are aware of them it will be easy to notice them laying eggs on the undersides of the Buddleia leaves. After the eggs hatch, the tiny caterpillars web over the leaves for protection. That’s the stage mine are in right now. 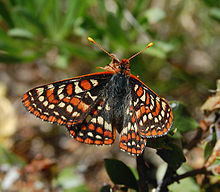 It has been a good year for Checkerspots here in Mariposa. 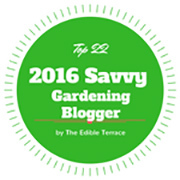 Two more bits of advice: start more Buddleia cuttings now and be careful what you wish for! Thank you for such a lovely amazing story! We are all learning new things everyday! Kathryn, after reading THE SOUND OF A WILD SNAIL EATING, I now rescue snails from our garden (happily munching on my plants) and relocate them to the creek alongside our house. I had an LOL moment imagining you picking through the yard waste bin to rescue those caterpillars! Checkerspots on Buddleia! Who knew? Adaptation in action? There are a few Buddleia species in Mexico so maybe checkerspots have adapted to those and are now switching to the Chinese Buddleia. Either way it’s really interesting. All species of buddleia are in the same genus, which makes them all chemically similar. It may take awhile for checkerspots to find them and use them, but ultimately they are all likely to be useful to checkerspots as host plants. Meanwhile, buddleia is important to all butterflies as a food source. For that reason, butterflies will not benefit from removing buddleia from our gardens.